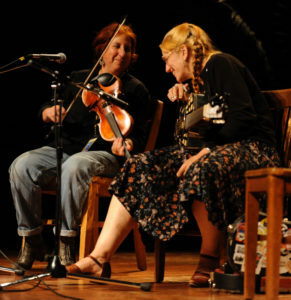 On Friday, February 17, the Portland Folk Music Society will present An Evening With Del Rey and Suzy Thompson two outstanding acoustic blues favorites at Colonial Presbyterian Church — Seattle’s resonator guitar and ukulele goddess Del Rey and Bay Area blues fiddler Suzy Thompson. Having worked as a duet since the mid-1980s, Rey and Thompson explore the upbeat, positive side of the blues in a show that is wise, womanly, witty, and well-played, always stirring things up with their masterful playing, show-stopping vocals, and humorous repartee. A vital member of the Bay Area acoustic music landscape for 30 years, Suzy Thompson’s exuberant bluesy fiddling and vocals have made her the accompanist of choice for acclaimed roots musicians like Jim Kweskin, Geoff Muldaur, and Mary Flower. Del Rey’s virtuosic resonator parlor guitar and ukulele playing embraces a host of old-time genres, including country blues, stride piano, classic jazz, and hillbilly boogie. Their repertoire includes vintage and original numbers from blues icons like Memphis Minnie and the Mississippi Sheiks, mixed in with flapper-era instrumentals from Kentucky to Trinidad. Please join the Portland Folk Music Society for this special night which starts at 7:30. Colonial Heights Presbyterian Church is located at 2828 SE Stephens Street. 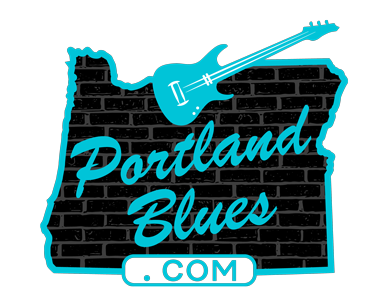 $18.00 for general admission, $15.00 for Portland Folk Music Society members, $9.00 for ages 12-18 and under 12 is free. Tickets can be purchased at SeatYourself.biz.